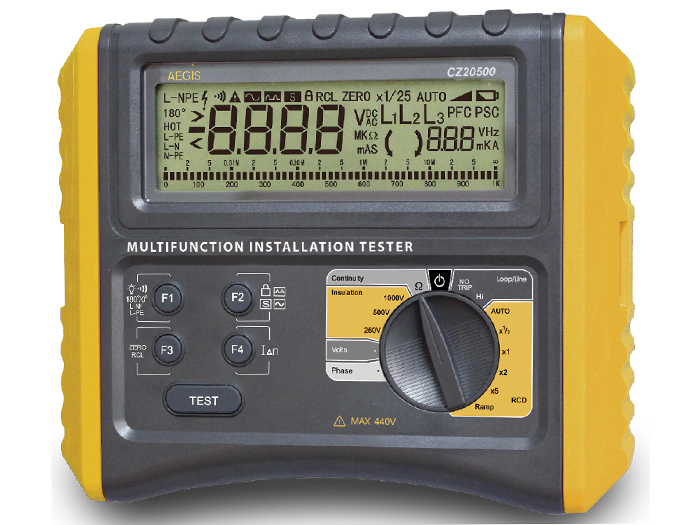 The perfect MultiFunction tester for any Electrician or apprentice. Insulation, Loop/Line, RCD, Phase, Voltage testing all in one ! 5 instruments in 1, the CZ20500 Multi-Function Electrical Tester is a must have! The CZ20500 Multi-Function electrical tester includes some of the latest advances in electrical testing, combining 5 instruments into 1! Insulation, Loop, Phase, RCD, and Voltage testing are all included in the one instrument, making your job of installation testing easier. The CZ20500 Multi-Function electrical tester is the perfect tool for certification of domestic, commercial, and industrial fixed wiring installations as required by Australian standards. The CZ20500 is a comprehensive digital multifunctional electrical safety test instrument. It features large-scale integrated analogy circuits, digital circuits and a microcomputer chip combination. The CZ20500 has multiple functions, higher accuracy and a more stable performance than its competitors, as well as a reliable and convenient mode of operation. It can be used to measure residual current devices, electric leakage protectors and the insulation of various electrical equipment, as well as performing grounding continuity tests. This Multi-Function Electrical Tester is your ideal choice for the maintenance, testing and inspection of electric protector of various electrical equipment.